The history of North Korea formally begins with the establishment of Democratic People's Republic of Korea in 1948. In the aftermath of the Japanese occupation of Korea which ended with Japan's defeat in World War II in 1945, the United Nations divided Korea at the 38th parallel, giving the Soviet Union responsibility to administer the north of the 38th parallel and the United States to the south. The Soviet Union refused to follow the UN mandate for democratic elections nation wide, leading the United Nations to declare the democratically elected government of South Korea as the sole legitimate government of the Korean Peninsula. That led to a divided nation in 1948, with the communist dictatorship in the north rejecting the United Nations proclamation and claiming sole right to rule Korea. Kim Il-sung began his to prepare his plan of attack on the south from that time. 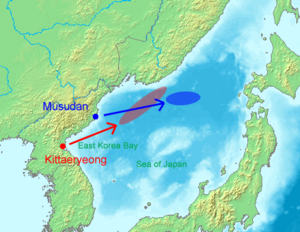 The split of Korea into north and south has precedent in Korean history. The northern regions of the Korean Peninsula, extending throughout Manchuria to the border with Russia and the Sea of Japan, have in pre-936 C.E. times been within the Korean borders. The Three Kingdoms of Goguryeo, Baekje, and Silla demarcate a historical, regional, distinction in Korea between the northern and southern cultures. Even though Korea is considered 100% homogeneous, the case has been made that Koreans in the southern part of the peninsula originated in indigenous Neolithic peoples while people in Manchuria and northern part of the Korean Peninsula originated from China. monument built to commemorate the 50th anniversary of the founding of the Korean Workers Party. Kim Il-sung's Soviet-backed communist dictatorship declared the Democratic People's Republic of Korea (DPRK) on September 9, 1948. The communist government claimed sole legitimacy to rule the entire Korea peninsula with Seoul as its capital. 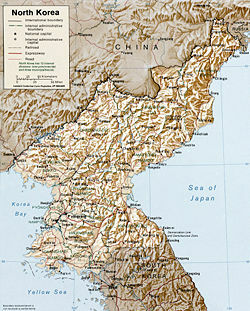 The DPRK controlled the Soviet-occupied northern parts of Korea with Pyongyang as the capital. Since the entry of Soviet forces in 1945, a provisional government structure had been imposed in the occupation zone with Kim Il-sung at its helm. Kim became the prime minister of the DPRK. The Democratic Front for the Reunification of the Fatherland, with the communist Workers Party of North Korea as its leading force, governed the illegitimate state. Kim Il-sung, although supported by the Soviets, possessed only partial political control at the time. Within his own party (the Workers Party) four separate factions existed, his own 'guerrilla' faction standing as the smallest. Kim Tu-bong held the party chairmanship while Kim Il-sung shared the vice chairmanship with Chu Nyong-ha. The three men belonged to different fractions. Moreover, non-communist political forces held significant sway in North Korea at the time. Two non-communist parties, the Democratic Party and the Chondoist Chongu Party, belonged to the Democratic Front and had a mass following of their own. Kim Il-sung gradually strengthened his control over the state and party affairs, eliminating fractional enemies within the party and neutralized the non-communist parties. On June 30 the Workers Party of North Korea merged with the Workers Party of South Korea (whose leadership had shifted to Pyongyang after a crackdown on their illegal activities in the south), forming the Workers Party of Korea. Kim Il-sung became the chairman of the unified party, whereas veteran Korean communist leader Pak Hon-yong (the leader of WPSK) became the vice chairman. Revolutionary monument in 西京 (平壤), People's Republic of Korea. Kim's government moved rapidly to establish a political system styled on the Soviet system, with political power monopolized by the WPK. The establishment of a command economy followed. Most of the country's productive assets had been owned by the Japanese or by Koreans who had been collaborators. The nationalization of those assets in 1946 placed 70 percent of industry under state control. By 1949 that percentage had risen to 90 percent. Since then, virtually all manufacturing, finance and internal and external trade has been conducted by the state. In agriculture, the government moved more slowly towards a command economy. The "land to the tiller" reform of 1946 redistributed the bulk of agricultural land to the poor and landless peasant population, effectively breaking the power of the landed class. In 1954, the dictatorship commanded a partial collectivization with peasants being urged, often forced, into agricultural co-operatives. By 1958, collectives conducted virtually all farming, and the co-operatives increasingly merged into larger productive units. A secondary school in Nampo, North Korea. Like all the postwar communist states, North Korea undertook massive state investment in heavy industry, state infrastructure and military buildup, neglecting the production of consumer goods. By paying the collectivized peasants low state-controlled prices for their products, and using the surplus thus extracted to pay for industrial development, the state carried out a series of three-year plans, bringing industry's share of the economy from 47 percent in 1946 to 70 percent in 1959, despite the devastation of the Korean War. Huge increases in expenditures for electricity production, steel production and machine building resulted. The government focused on producing tractors and other agricultural machinery in large numbers with little increase in agricultural production. By 1958, North Korea's economy still depended largely on aide from the Soviet Union and China, the its standard of living lagging dramatically behind South Korea. As a result of those dictatorial changes, the population suffered malnutrition and food shortages while the state controlled press painted a rosy picture. Any one contradicting the state line that North Korean agriculture surpassed South Korea's, and that the North Korean standard of living surpassed South Koreans dramatically, received a night time visit from the Kim Il-sung's secrete police force often never heard from again. Standards of living, suffocated by the collectivization of farms, rapidly decreased in North Korea in the later 1950s and into the 1960s. Only Kim's tight dictatorial control of the police, army, and media kept the North Korean farmer from rebelling in a classic Peasant Revolt. Consumer goods, always in chronic shortage from the state-controlled mandate for production rather than consumer-driven production as in the South, led to serious discontent. Still, few dared protest or even voice their discontent for fear of arrest and death in a work camp. In the cities, a life of severe forced labor and constant demands for greater productivity plagued the workers. Kim's worker's paradise, apart from the state controlled propaganda to the contrary, resembled more a worker's hell. The establishment of Syngman Rhee's government in the South by United Nations mandate and receiving the full support of the United States government, led to the establishment of a fledgling democracy. A communist instigated insurrection in October 1948, successfully controlled by joint South Korean police and United States military action, led Kim Il-sung to abandon hope of gaining control over South Korea by revolution from within. From early 1949 Kim sought Soviet and Chinese support for a military campaign to reunify the country by force. 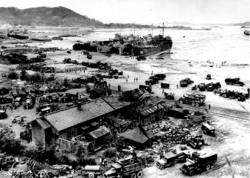 The withdrawal of most U.S. forces from South Korea in June 1949 left the southern government defended only by a weak and inexperienced South Korean army that, in actuality, served as a police force. The South Korean government also had to deal with a citizenry of uncertain loyalty. The North Korean army, by contrast, had been the beneficiary of the Soviet Union's, outdated Soviet WWII-era equipment, and had a core of hardened veterans who had fought as anti-Japanese guerrillas or with the Chinese Communists. Initially Stalin rejected Kim's requests, but in late 1949 the victory of the Communists in China and development of the Soviet nuclear weapons made him re-consider Kim's proposal. In January 1950, Stalin finally gave permission to stage an invasion. 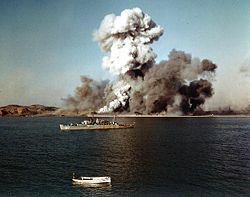 The Soviet provided limited support in the form of advisors who helped the North Koreans as they planned the operation, and Soviet instructors trained some of the Korean units. 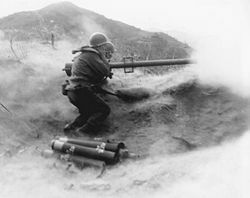 From the very beginning Stalin made it clear that the Soviet Union would avoid a direct confrontation with the U.S. over Korea and would not commit ground forces even in case of some major military crisis. Kim and Stalin set the stage for a civil war between two rival regimes on the Korean peninsula. 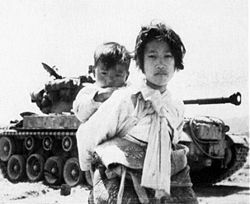 For over a year before North Korean forces attacked the southern government on June 25, 1950, the two sides had been engaged in a series of bloody clashes along the 38th parallel, especially in the Ongjin area on the west coast. On June 25, 1950 the northern forces escalated the battles into a full-fledged offensive, crossed the parallel enforce with an invasion plan. Due to a combination of surprise, superior military forces, and a poorly armed South Korean army, the Northern forces quickly captured Seoul, forcing Syngman Rhee and his government to flee further south. The North Korean attacks falter due to decisive action by the United Nations and the United States forces stationed in Japan. Due to a Soviet boycott of the United Nations Security Council over a rejection of China's application for membership, a unanimous vote put the United Nations into the first test of collective security. In two days after declaration of war against the North Korean invaders, units from United States forces arrived in Korea and stationed directly in the path of the invading North Korean forces. Virtually a suicide mission, the action led North Korea to halt and regroup long enough for United Nations forces to arrive in mass. A few months later, Gen. Douglas MacArthur led a bold attack behind North Korean lines in Incheon, driving North Korean forces in retreat. By October, the U.N. forces had retaken Seoul and captured Pyongyang, and it became Kim's turn to flee. But in November, Chinese forces entered the war and pushed the U.N. forces back, retaking Pyongyang in December and Seoul in January 1951. In March U.N. forces retook Seoul, and the war essentially became a bloody stalemate for the next two years. The front stabilized in 1953 along what eventually became the current Armistice Line. After long negotiations, the two sides agreed on a border formed by the Korean Demilitarized Zone, and a truce was declared. Note that the warring nations never signed an official peace treaty, leaving the two Koreas technically at war since 1950. After the war, Kim tightened control of North Korean politics, with the support of the armed forces whom he, in classical dictator style, made sure they received pay and benefits. Pak Hon-yong, party vice chairman and Foreign Minister of DPRK, received blamed for the failure of the southern population to support North Korea during the war, suffered execution after a show-trial in 1955. Most of the South Korean leftists who defected to the North in 1945–1953 also received charges of espionage or other crimes against the state, leading to their execution, imprisoned or exiled to remote agricultural and mining villages. Kim continued to purge his rivals such as Kim Tu-bong, clearing the way to absolute power and the creation of a god-like status enforced by secrete police. The 1954–1956 three-year plan proclaimed the goal of repairing the massive damage caused by the war, bringing industrial production back to prewar dismal levels. Kim followed that with a five-year plan of 1957–1961 and the seven-year plan of 1961–1967. Those plans brought failed to bring growth in industrial production and substantial development of state infrastructure. By the 1960s North Korea's state controlled organs proclaimed the North Korea had become the second most industrialized nation in East Asia, trailing only Japan. In fact, Kim's war adventures and total state control of the economy had put North Korean on the brink of economic ruin. Only massive aid by Russia and China for ideological reasons, to advance world communism, kept North Korea for collapse. All the while, Kim used his police force to increase his image as a god and to demand worship by the people of North Korea or suffer imprisonment and death. Kim Il-sung promoted Juche ("self-reliance"), a slogan he began to develop in the late 1950s, ultimately proclaiming that North Korea's official ideology, displacing Marxism-Leninism. Juche advanced the goal of self-reliance through military force, enabling North Korea to advance communism throughout the Korean peninsula. Juche aimed to make North Korea self-sufficient. Ironically, the North Korean elite, the New Class, had an insatiable appetite for quality and luxury products from Japan and the West while the people of North Korea suffered without adequate food or housing. The dictatorship of the proletariat approved that practice, as the communist ruling government served as a transition to the Worker's Paradise. Although the state-controlled press worked hard to secure the truth of the common person's life in North Korea, the word of their real living circumstances came to South Korea, the West and Japan through defectors. The philosophy of Juche served to support Kim Il-sung's communist dictatorship but did nothing to improve the life of common North Koreans. Kim used Juche to urge the North Korean people to resist foreign invasion by launching a series of mass-campaigns designed to strengthen the country economically, militarily, and culturally. The Sino-Soviet split placed North Korea's communist dictatorship in jeopardy from 1960. Relations between North Korea and the Soviet Union worsened when the Soviets concluded that Kim Il-sung supported the Chinese side, although Kim hoped to use the split to play China and the Soviets off against each other while pursuing a more independent policy. That resulted in a sharp decline in Soviet aid and credit, which the Chinese lacked to wealth to compensate. Kim's enthusiasm for Mao Zedong's policies declined, despite his rhetorical denunciations of "revisionism." While he supported Chinese campaigns such as the Great Leap Forward, he saw Maoist initiatives such as the Hundred Flowers Campaign and the Cultural Revolution as destabilizing and dangerous. In that way, Kim Il-sung showed his determination to mark an independent path for North Korea when possible. Due to the inherent contradictions in Juche, the massive expenditures on military without Chinese and Russia aide, the failure of the collectivization program, and the rejection of free enterprise, North Korea suffered declining economic fortunes as have all communist dictatorships. North Korea's lack of foreign reserves, and the prohibition many Western nations had placed on trade and investment in North Korea, spiraled the country into economic depression. During that time, Kim strengthened his grip on the country, looking for every opportunity to overthrow the South Korean government. By the 1970s, North Korea's economic condition became dire. Even the tight control by the state media had a hard time presenting a rosy picture of North Korean life, the official line becoming one of "slight economic reverse." The Soviet Union's cutoff of subsidized oil dealt a staggering blow to North Korea. At the same time, the price of oil on the international markets had reached an all time high combined with North Korea's depleted reserves of foreign currencies, especially US dollars to create emergency conditions. The North Korean regime began to turn to weapon sales, drug sales, and counterfeiting United States dollars as ways of dealing with a shortage of US dollars. Still, Kim continued to maintain one of the largest standing armies in the world. Kim Il-sung advanced the idea through his communist-controlled press that he needed to build up his military to establish independence from Chinese and Russian aid. In reality, China and Russia increasingly cut North Korea off for military and economic aid and, moving into the 1980s and 1990s, the two governments increasing found Kim to be an embarrassment. His attempt to assassinate Park Chung-hee, to build invasion tunnels under the DMZ, and to provoke war with the United States and South Korea through incidents like the Pueblo seizure, left both China and Russia unenthusiastic. Stalin's legacy had been denigrated in Russia and Kim ruled in the Stalinist fashion. Kim Il-sung died in 1994, and his son, Kim Jong-il, succeeded him as General-Secretary of the Korean Workers Party. Although Kim Il-sung left the post of President vacant, Kim Jong-il became Chairman of the National Defense Commission, a position described as the nation's "highest administrative authority," and thus North Korea's de facto head of state. His succession had been decided in the late 1980s, with the support of the most important interest group, the armed forces led by Defense Minister Oh Jin-wu. During the decade of Kim Jong-il's rule, North Korea's economy standard of living decline precipitously for its twenty-three million people. From 1996 to 1999 the country experienced a large-scale famine that left some 600–900,000 people dead and a generation of children suffering from the long term effects of malnutrition. Yet Kim's lifestyle, and the lifestyle of the New Class of North Korean leaders, diminished not in the least. Faced with a transformed Russia and China, North Korea no longer receives the gifts of aid that propped the country for 40 years. With his nation in bankruptcy, Kim Jung-il faces a desperate task to keep North Korea as a communist dictatorship. Only Castro's Cuba survives with him as an old school communist nation. The inefficiency of North Korea's Stalinist-style collective agricultural system contributed to the disaster. North Korea spends about a quarter of its GDP on armaments, including the development of nuclear weapons, and keeps nearly all able-bodied males aged 18–30 in uniform, while the basic infrastructure of the state is allowed to crumble. As a result, North Korea now depends on international food aid to feed its population. According to Amnesty International, more than thirteen million people suffered from malnutrition in the DPRK in 2003. In 2001 the DPRK received nearly $US300 million in food aid from the U.S., South Korea, Japan, and the European Union, plus much additional aid from the United Nations and non-governmental organizations. Unspecified (but apparently large) amounts of aid in the form of food, oil and coal are also provided by China every year. Despite that North Korea maintained its violent rhetoric against the U.S., South Korea and Japan. The supply of heating and electricity outside the capital has run out, while food and medical supplies have nearly so. When a bad harvest hits, as has been persistently the case over recent years, the population faces actual famine: a situation never before seen in a peacetime industrial economy. Since 1997 a steady stream of illegal emigration has flowed into China, despite the efforts of both countries to prevent it. Kim Jong-il has said that the solution to this crisis lies in earning hard currency, developing information technology, and attracting foreign aid. Yet, despite some movement towards reform, he has not substantially reduced the state's control over the economy or introducing the market-oriented reforms which have produced spectacular economic growth in China and Russia since 1979. So far the DPRK, not surprisingly given Juche and UN attempts to isolate them, has made little progress in attracting private capital. In July 2002 Kim announced some limited reforms. The government devalued the currency and allowed food prices to rise in the hope of stimulating agricultural production. Kim announced that food rationing systems as well as subsidized housing would be phased out. He introduced a "family-unit farming system" on a trial basis for the first time since collectivization in 1954. The government also set up a "special administrative zone" in Sinuiju, a town near the border with China. The Central Committee granted the local authority near-autonomy, especially in its economic affairs. Kim attempted to emulate the success of such free-trade zones in China, but attracted little outside interest. Despite some optimistic talk in the foreign press the impetus of those reforms has not been followed with, for example, a large-scale decollectivization such as occurred in China under Deng. President Kim Dae-jung of South Korea actively attempted to reduce tensions between the two Koreas under the Sunshine Policy, but that produced few immediate results. North Korea has faced renewed external pressure from the United Nations over its nuclear program, reducing the prospect of international economic assistance. By labeling North Korea as a member of the "axis of evil," Bush put the already embattled Kim in a dire situation, contributing to his duplicity in on again, off again, agreements to end nuclear weapons building. Kim has resorted to drug sales as well as highly expert counterfeiting of United States currency as a way to keep his dictatorship alive. North Korea remains a Stalinist state. 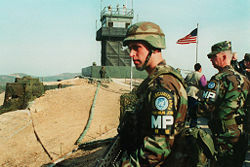 The lack of access to the foreign media and the tradition of secrecy in North Korea means that little news about political conditions escapes, but Amnesty International's 2003 report on North Korea states "there were reports of severe repression of people involved in public and private religious activities, including imprisonment, torture and executions. Unconfirmed reports suggested that torture and ill-treatment were widespread in prisons and labor camps. Conditions were reportedly extremely harsh." North Korea may soon face an East German-style collapse or, more likely, a Soviet or Chinese style transformation. Evidence exists that South Korea would like to avoid the huge expense to restoring North Korea to viability. The ecological disaster alone has an enormous price tag the South Korean government would need to pay through taxing the South Koreans. Most likely, South Korea will aim for a gentle landing of North Korea in the democratic, free enterprise world. South Korea and China view with a North Korean collapse with great trepidation because of the fear of a sudden and large exodus of North Korean refugees into their countries. Kim immediately crushes opposition with North Korea, so a Tiananmen type protest is unlikely. 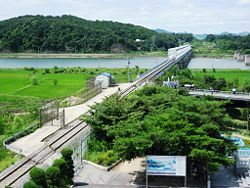 In 2002 Kim Jong II declared that "money should be capable of measuring the worth of all commodities," followed by some small market economy relaxations, and announcing the creation of the Kaesong Industrial Region with transport links to South Korea. Experiments to allow factory managers to fire underperforming workers and give bonuses have begun. China’s investments in North Korea increased to $200 million in 2004. China has counseled North Korea’s leaders to gradually open the economy to market forces, and Kim might successfully follow that path as well as China's policy of keeping political control firmly in the hands of the communist party. North Korea has a very active missile development program, although they have yet to successfully test their longer-ranged missiles. In 1998, North Korea tested a Taepondong-1 Space Launch Vehicle, which successfully launched but failed to reach orbit. On July 5, 2006, they tested a Taepodong-2 ICBM that reportedly could reach the west coast of the U.S. in the 2-stage version, or the entire U.S. with a third stage. The missile failed shortly after launch, so its exact capabilities, or how close North Korea to perfecting the technology, remain unknown. North Korea's advancements in weapons technology have the purpose, at the very least, of giving them leverage in ongoing negotiations with the United Nations and other countries. At the worst, North Korea may decide to take the world down with it in a nuclear holocaust. On Feb 13, 2007, North Korea signed an agreement with South Korea, the United States, Russia, China, and Japan, in which North Korea will shut down its Yongbyon nuclear reactor in exchange for economic and energy assistance. Since that agreement, the United Nations has yet to confirm the closure and sealing of the facility. History of "History of North Korea"
This page was last modified on 10 January 2018, at 15:17.